Also Recommended: Laputa, Future Boy Conan, Snow Queen, Katri - Girl of the Meadows. 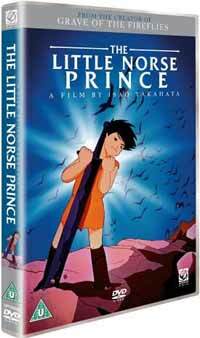 Notes: While "The Little Norse Prince" is considered a part of Studio Ghibli's collection, the movie itself actually predates the birth of the studio by around 18 years. This movie is not currently available in DVD form in the USA, but it is available (in dubbed form) on Netflix.com as a stream. This review is based on a copy of the R2 DVD. Having narrowly escaped being hunted down and killed by a pack of wolves lead by a silver wolf, Hols returns to find his father dying. With his last breath, Hols' father urges Hols to return to his home and find his people again, if anyone still remains after Grunwald's rampage. And therein lies the first problem, because despite the settings mostly being a seaside fishing village, the movie itself didn't really awaken any kind of familiarity to me. Rather, it seems more like the Little Norse Prince has taken several elements of varying nationalities and blended them together into an arcetypical fantasy movie. Hols' name is apparently not based on Horus, an Egyptian deity, but instead more or less derived from some randomly selected Northern European names. But the movie quickly stated that he's destined to become the Prince of the Sun, so the misunderstanding would be understandable (even if the spelling of the name would be more like "Holus"... probably.) Furthermore, him obtaining his sword is more or less reminiscent of a certain Arthurian legend already covered by a Disney movie. There's also the inclusions of bagpipes and linedances that doesn't particularly adhere to Scandinavian cultural traits, and while this crosses over into the area of nitpicking, still made this movie feel as Scandinavian as the X-Files episode I watched many years ago. Which is to say ... not much. From a technical standpoint, this movie has aged noticeably, but despite this, it's looking pretty good for a forty-plus year old movie. And, thankfully, this is the case where the cover art doesn't really represent the quality of the visuals itself. In a scene near the beginning of the movie, colors -- and the lack thereof -- is actually used to represent the life and happiness of the residents of the fishing village the movie mostly takes place in. (Which leads into the usage of the aforementioned bagpipes and linedances.) The character art is fairly simple, though backgrounds and animation quality is pretty good, even by movie standards. There is some issues with a scene in the middle of the movie, where an entire high-octane action scene is represented solely by way of still images. It's abrupt, jarring and ruins the mood and the urgency of the scene itself. Storywise, the movie is definitely what you would call "traditional". From a critical standpoint, the whole setup is very simple, and would later go on to inspire works like Laputa and Future Boy Conan. Hols finds his evil counterpart in Grunwald, an almost comically villainous character sitting on his throne in a castle made up of ice. There, he terrorizes the remaining few of the "Norse" people through various types of animals, like the wolves, but also a giant pike. But The Little Norse Prince does manage to add a few layers of complexity to its characters and settings from time to time. Grunwald isn't just some two-bit villain, and we learn that the moment we meet him, where he tries convincing Hols to become his partner. And even after Hols refuses him, Grunwald still has a multifaceted plan to deal with Hols' sudden emergence at the village he's lording from afar, plans which actually met with a fair amount of success at first. It does lend itself to a few tropes in the process -- Grunwald has obviously never read Peter's Evil Overlord List -- but outside of that, the movie makes sense in an of itself. There's also some subplots centered around the village leader, who grows distrustful of Hols and his sudden popularity, and his aide, who either is or will be in league with Grunwald before all this is over. And that's not even starting on Hilda, who carries a secret of her own. Problem is, this still leaves The Little Norse Prince as a bit of a disappointment, both as a Ghibli movie and as a representation of the Norselands as a whole. Ghibli already has better works (more or less) based on Scandinavian works in Panda go Panda, initially meant to be based around a Swedish children's TV character. Plus, for general European storytelling quality, we already have shows like Katri, Girl of the Meadows or even the more recent Snow Queen, both of which are based on actual Scandinavian works of literature. The Little Norse Prince is always worth watching, but if your time is limited, it would probably be much better spent on better works than this. Recommended Audience: Jeremy - Well, like I said this was initially targeted at children and the trailer even informed me that it was for "good little boys and girls". There is a surprisingly amount of violence from a Western perspective though. However, despite the fact that an ax and a sword are Hols's preferred weapons there is no blood and several creatures just seem to dissipate into thin air when they are slashed. The closest we get to sexual situations is one line in a song about how a new bride will "bear the children" of her husband. Some of the attacks of evil creatures and the general menacing nature of the ice demon might be a bit too much for young children, but older children should be fine. Stig - Oddly violent for an U rated movie, what with Hols facing off against wolves and rats, not to mention the giant pike. It's not particularly gory and bloody, but you can easily see Hols slash (and kill) wolves with his axe. Nevertheless, the movie's UK rating is U, so there you go.